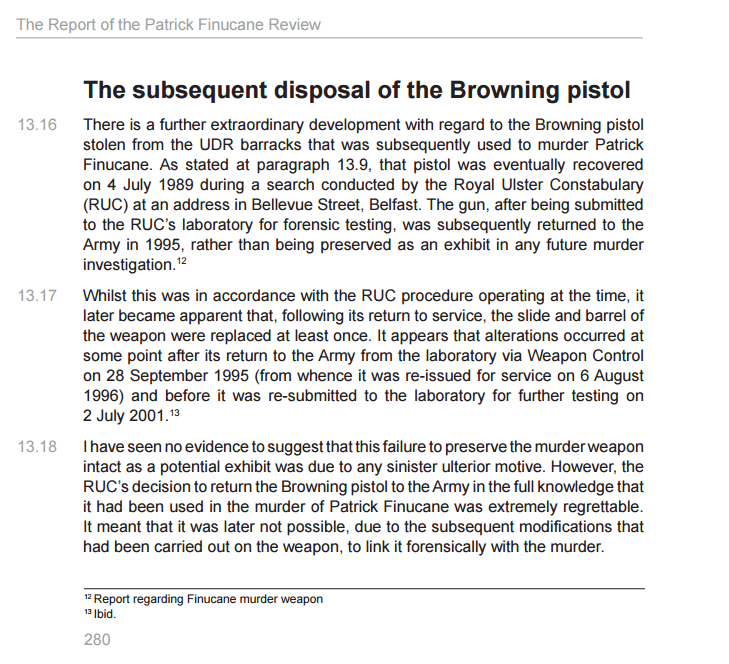 The Browning pistol used in the murder of Pat Finucane was “stolen” from Palace barracks Holywood, County Down, along with other weapons, two years before Pat’s murder. A UDR colour sergeant was convicted of the theft. The suspicion is that this was part of a collusion strategy to arm Loyalist groups. The Browning was later recovered in a house in Bellevue Street, Belfast in July 1989. It was retained by the RUC as an exhibit in the murder investigation. It was then handed back to the British Army in 1995 by WERC and modified. It was later seized by John Stevens’ team. However, the most concerning aspect of this is that Sir Desmond de Silva in his findings on this issue, said “I have seen no evidence to suggest that this failure to preserve the murder weapon intact as a potential exhibit was due to any sinister ulterior motive”. This finding, and others like it, are not accepted by the Finucane family and would be challenged at a public judicial inquiry, which has been denied to the Finucane family by David Cameron. “This revelation in last night’s BBC Panorama programme is shocking. Many families are in the same position as ourselves when we were made aware that the Browning pistol used to murder Pat was not held as a murder exhibit, as it should have been, but was modified, removing forensic evidence, and handed over to the British Army. It was eventually seized by the Stevens team.